An accidental is a musical symbol, such as a flat or sharp sign, that tells us to alter a note either by “raising” or “lowering” it. At this point, you might be wondering what the point of this system is. Why not just give each note its own name, and be done with it? The main reason is that music theory and notation are supposed to represent the way music sounds. When we hear a note followed by the note a half step up (out of the key), it sounds like the original note has been altered (as opposed to a totally new note). So the note name reflects this. Instead of giving it a totally new name, we use the same name but indicate that it has been changed. Like if your friend dresses up in a costume, you can still tell it’s them, but their appearance has been altered. They haven’t turned into a new person. That’s the basic concept. We don’t need to understand this perfectly just yet; all will become clear in due time. As we move forward, we’ll see exactly how accidentals work when it comes to note names, scales, and ear training, and in different musical situations. If we take any note, and raise it by a half step, that note is given a sharp symbol, which looks like this: ♯ (similar to a pound sign or number symbol). For example, C raised by a half step would become C♯, pronounced C sharp. F raised a half step would be F♯, or F sharp. The same idea works in the opposite direction, too. If we lower any note by a semitone, the note gets a flat symbol (♭, looks sort of like a lowercase “b”). So far, we’ve been focusing our attention on the white keys of the piano. Now that we understand accidentals, we’re ready to learn the names of the remaining notes, the black keys. We’ll start with C as an example. 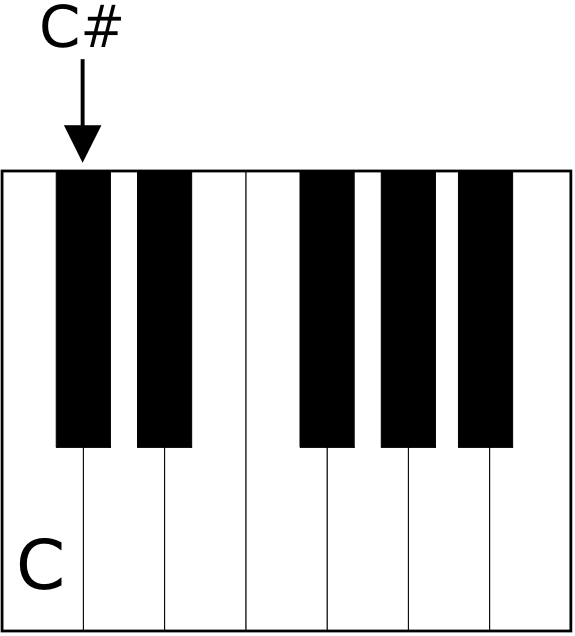 The black key just to the right of C is called C♯ (C sharp). This is because it’s a half step above C, so in effect we’ve raised C by a half step, and we get C♯. This makes life easier for us, since we don’t have to memorize any new letter-names in order to learn the black keys. As long as we know where C is, it’s easy to identify the black note above it as C♯; it’s just a half step up from C.
However, C♯ is not the only name for this note. If we notice, this very same black key is also immediately below the note D. So we can also think of it as D being lowered by a half step, and call it D♭ (D flat). Both names are correct. The same black note is a half step up from C (C♯), and it’s also a half step down from D, or D♭. So which name should we use? For our purposes right now, it really doesn’t matter. The note can be referred to as either C♯ or D♭, and we should learn both names. As we go on, though, we’ll see that often only one of the two names is appropriate, and this depends on the musical context, like what key the music is in, and which direction the melody is moving. For now, though, both names are fine. Let’s continue learning the names of the black notes. 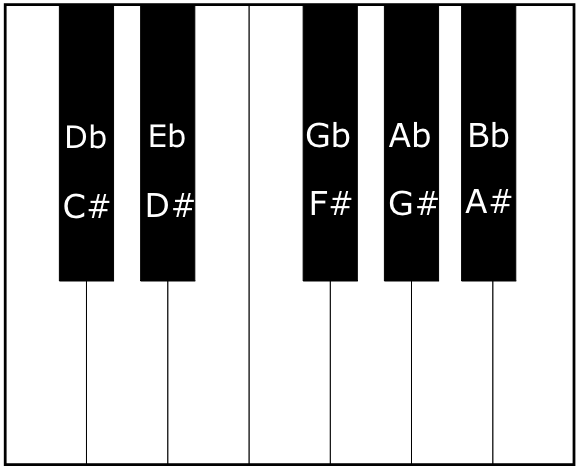 The next black key up from C#/Db has two names as well; it’s either called D♯, since it’s a half step above D, or E♭, since it’s also a half step below E.
This works seamlessly with the system we learned earlier of naming notes based on their octave register (see Organizing Note Names for more info). For example, we could refer to a note as F♯2, or B♭5, etc. Letter name, accidental, followed by the octave number. Sometimes, we may need to raise or lower a note by two semitones, or a whole step. In this case, we use two new symbols, the double sharp (×), and the double flat (bb). 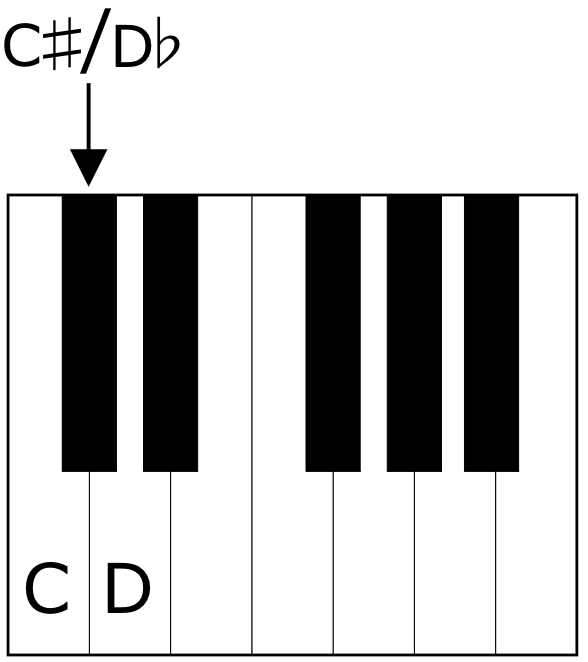 For example, we have a C note: Raise it one semitone, and it becomes C♯, C sharp. Raise it one more semitone, and we have C×, or C double sharp (which is also the same note as D). E lowered once would be E♭. Lowered again, and it’s Ebb, or E double flat (which is also another name for D). Double sharps and double flats aren’t nearly as common as plain old sharps and flats, but there are times when we need them. That’s as far as it goes, however – there aren’t any triple flats or triple sharps. There is one more musical symbol we have to learn, and that is the natural symbol, which looks like this: ♮. A natural sign means that we should play the note without any accidentals. C♮ means plain old C, without any sharps or flats. Now, why would we need a symbol to tell us to play a plain old note? Why not just write nothing? To fully appreciate our system of accidentals and raising/lowering notes, we need to know a thing or two about scales, chords, and tonality. For now, we know what we need to in order to name the black notes, and we also understand this basic concept of raising or lowering a note by a half step or whole step. What does it mean to “raise” a note? Which symbol is used to indicate that a note should be lowered by a half step? Which symbol is used to indicate that a note should be raised by a half step? Is there such thing as a double flat? Is there such thing as a triple flat? What is the purpose of a natural symbol (♮)?